New South Wales is Australia’s most diverse State and home to the country’s largest and most cosmopolitan city, Sydney and Australia’s Capital Territory, Canberra. There are six World Heritage sites to explore including the famous Sydney Opera House. The State has a string of accessible, sparkling beaches stretching from north to south, a vast, colourful outback to the west, Australia’s highest mountain offering every type of snow sport, and myriad meandering waterways. Sydney, with its sublime natural setting, glamorous beaches and appetite for the fine things in life, is one of the world’s great destinations. The New South Wales Coast is a subtropical climate region of Australia which experiences four distinct seasons. The eastern areas are characterised by temperate weather while the central coast experiences more humid weather and the south coast attracts slightly cooler weather as it is closer to the ocean. The weather and climate of the NSW Coast is relatively mild with well-defined seasons that feature hot summers and cool winters.  The north west of the NSW Coast is the hottest region and the seasons in these areas are less apparent featuring hot and wetter summers and cooler but drier winters. There are colder regions that can experience snow and frost during winter however these are confined to further inland. Average maximum temperatures for the NSW Coast range from 26 °C in summer and 16 °C in winter with average minimum temperatures falling between 19 °C in summer and 7 °C in winter however the weather and climate is relatively mild year round. The major part of New South Wales, west of the Great Dividing Range has an arid to semi arid climate. Rainfall averages from 150 millimetres (5.9 in) to 500 millimetres (20 in) a year throughout most of this region, and summer temperatures can be scorching hot while winter nights can be freezing cold. Australia’s largest city with a population of almost 4.8 million, Sydney is known around the world for its famous opera house, sparkling harbour and heady mix of cosmopolitan and laid-back lifestyle. Great beaches, great weather, great shopping and world class dining make for the perfect city in which to live and work. Located just two hours’ drive north of Sydney and close to the stunning Hunter Valley wine making region, Newcastle is not only home to the largest coal exporting harbour in the world but a city of rich history, quirky culture and attractive beach and bushland scenery. The University of Newcastle is one of Australia’s foremost universities. Only 82 kilometres south of Sydney in the pretty coastal Illawarra region is Wollongong, a city of beautiful beach and clifftop landscapes, perfect for outdoor living and adventuring. With a population of almost 300, 000, Wollongong provides an ideal mix of vibrant city and relaxing coastal lifestyle. The lovely coastal town of Coffs Harbour is located on New South Wales’ north coast, approximately 6 hours’ drive north of Sydney and 4.5 hours south of Brisbane. Great family living away from the big cities and close to the all the glory that natural beaches and national parks have to offer. Visit other states and territories.